Dubai, 15 August 2018: Awesome Awaits this Eid at LEGOLAND® Dubai with a range of fun family activities on offer from 16-24 August. 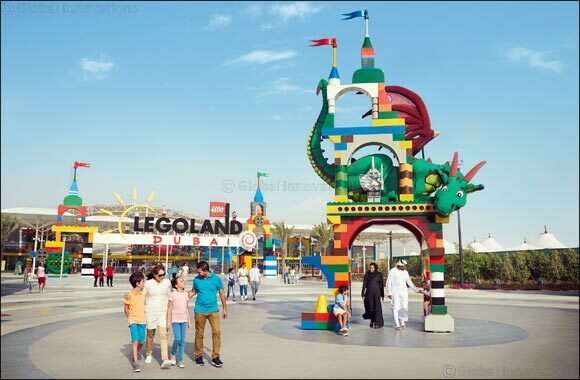 With the holiday almost upon us, LEGOLAND Dubai has rounded up the top reasons to visit the park over the holiday, while keeping all the family entertained. Guests visiting LEGOLAND Dubai still have the chance to experience an awesome new activity or offer each day of the week with the ‘70 Days of Summer' program, running until 31st August 2018. This includes Thursday Movie Nights with screenings of various LEGO Movies, dance classes on Fridays where kids can learn moves to their favourite songs from the LEGO Movies, Saturday parties with Ollie, The Dragon and many of his friends, and much more! Daily, there are prizes galore, with more than AED 10,000 in LEGO merchandise being given for free to guests over the course of the summer. An Eid family celebration in the Water Park? Count us in! With a variety of water slides and attractions, LEGOLAND Water Park is designed to provide a full day's interactive experience for families with children between the ages of 2-12 to enjoy together. The Water Park features 20 water slides and attractions, each offering a unique fun-soaked experience and is guaranteed to help beat the heat this summer. LEGOLAND Dubai offers a wide range of must-try indoor activities perfect for the summer months across its six themed lands; ADVENTURE, FACTORY, IMAGINATION, KINGDOMS, LEGO CITY and MINILAND. MINILAND is located in the heart of LEGOLAND Dubai and is made up of 20 million LEGO® bricks, recreating Dubai's iconic skyline and key landmarks from around the Middle East and international destinations. Divided into 12 different clusters, the MINILAND at LEGOLAND® Dubai is the first ever indoor and air-conditioned MINILAND at a LEGOLAND park. Families can also take part in the fun Factory Tour within FACTORY where they will learn how a LEGO® brick is produced and receive their very own LEGO brick fresh from the casting line. In celebration of the Eid Al Adha holiday, LEGOLAND Dubai has extended its opening times from Thursday 16th of August until Friday 24th of August. The theme park will be open from 12pm – 10pm during this period while LEGOLAND Water Park will be operational from 10am – 7pm daily. And if that's not enough, all guests visiting LEGOLAND Dubai will receive the limited edition 2018 Eid Al Adha brick! UAE Residents can enter LEGOLAND Dubai or LEGOLAND Water Park with tickets starting at just AED 165 (AED 235 for non-residents). This season, experiencing awesome at the Parks has never been easier with the All You Can Eat offer, with tickets starting at AED 235 to play and dine all day, including unlimited food and beverages for UAE residents aged 3 and above. Save even more when booking tickets online at LEGOLAND.ae 3 days in advance of your visit.